Stockholm, Sweden - 26 November, 2018 - Load Impact, the leading provider of SaaS solutions for load testing of websites, apps and APIs, is excited to announce Performance Alerts for automated load testing results analysis. One of the challenges DevOps teams face is understanding the results of a performance test run. 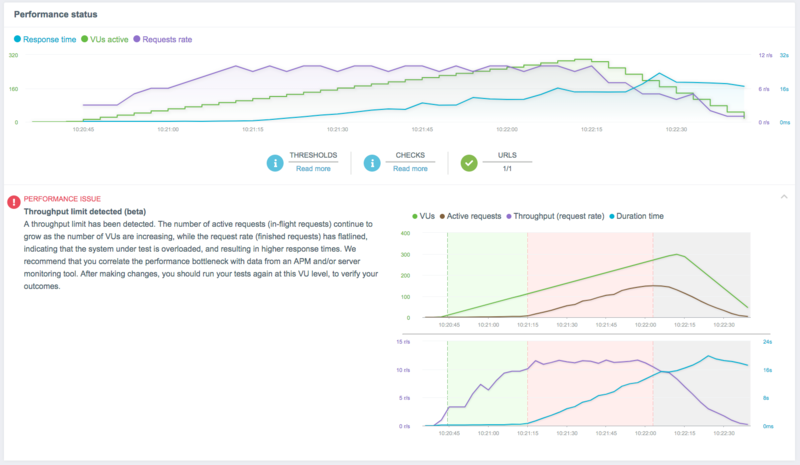 Load Impact Insights Performance Alerts allow developers, performance engineers and QA teams to quickly see where they have a performance issue, either in the system under test, or in their test scripts. Automated results analysis can really cut down on the time you spend poring over your test data to figure out where the bottlenecks are. In our user survey, we found that automated results analysis is the second most wanted capability for a load testing solution. Load Impact automatically analyzes your k6 performance test results when the output is streamed to Load Impact Insights from the command line (k6 run -o cloud script.js), or when the test is executed in the Load Impact SaaS application. The target system (website, SaaS / web app, API, or microservice) has hit a throughput limit, meaning the request rate has flatlined. Your system is overloaded. “Performance Alerts are another key feature that allows DevOps teams to bring high quality software to market faster and at lower cost,” said Haakan Tylen, CEO at Load Impact. DevOps teams can try out k6, Load Impact Insights and Cloud Execution for free. k6 will always be freely available (see the GitHub link below) while Load Impact Insights and Cloud Execution are available through a 30-day free trial.